Quote of the Day: "Beyoncé, Superstar but Not a Fashion Icon"
I know, I know: blasphemy. One does not criticize the most feted woman on the planet. But think about it. Beyoncé hasn’t moved, or influenced, the direction of fashion writ large in the way that, say, Rihanna, the winner of this year’s CFDA Fashion Icon award, has. (See, for example, the luxe athletic pieces peppering collections like Pucci, Balmain and Tom Ford.) She doesn’t wear things and spark a million trends, like Madonna once did with her jeweled crosses and lace minis, not to mention her bullet bra corsets. She doesn’t cause items to sell out overnight, like wee Prince George. 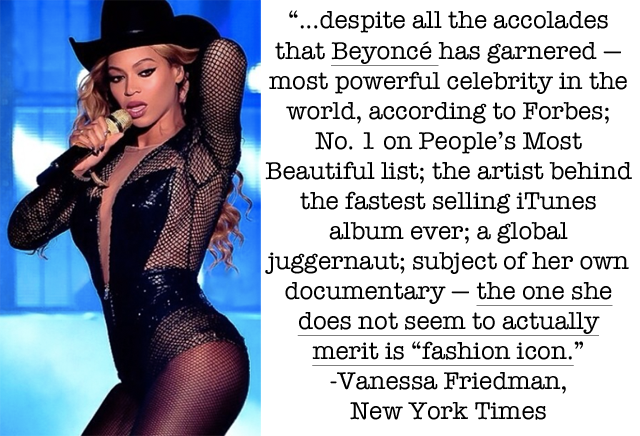 Friedman will no doubt be met with thousands of angry responses from Beyonce devotees. But there's no denying that her arguments hold weight. This is definitely an article worth a read if you have a minute or two today.